Royal Sovereign Colour Shapers are rubber tipped blending tools for pushing color around, paint brushes, paint squeegees that come in five different tip shapes and three different hardnesses. Royal Sovereign makes a good variety of them, five different sizes from 0 to 16. Soft ones have white tips and are too soft to move most oil pastels, though they will shove around Sennelier on the paper pretty well. Firm ones have medium gray tips and are much better for oil pastels. Extra Firm ones are called Clay Shapers and the tips are nearly black as you can see in the photo above. 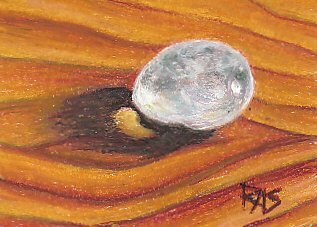 I used my size 2 Cup Chisel Clay Shaper tool to blend my clear quartz pebble study below. Pentels are a stiff hard oil pastel with strong opacity, so blending light applications took quite a bit of pressure. The hard Clay Shaper handled it beautifully and so I was able to soften the edge of the shadow, blend the shading within the shadow and touch up some areas within the stone as well as edge up the hard edge of the pebble. 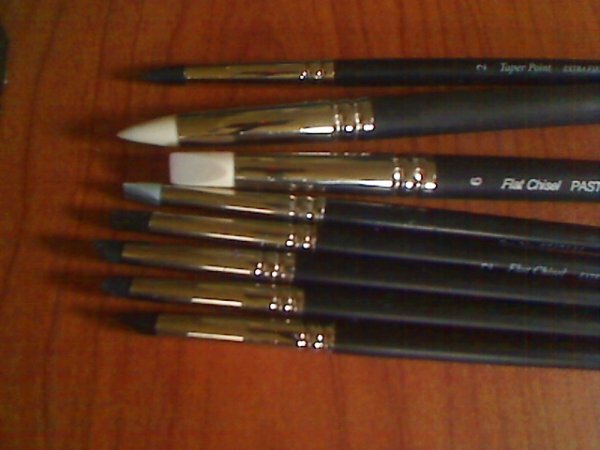 My first Colour Shapers were a size 6 Taper Point and size 6 Flat Chisel, both Soft, they came in a set of Pastel Tools from Blick along with a pony hair scrubber brush and a fan brush also from Royal Sovereign. They proved wonderful for pushing around soft pastels and blending them. I used these tools constantly. I tried them with oil pastels and got some decent results but was concerned about wearing them out because I had to press so much harder. So I purchased a size 2 firm Flat Chisel for use with my oil pastels. This became my favorite among my Colour Shapers for quite some time. It worked out great, a much better tool for the job. It's good for edging and blending. Edging I can scrape with it and push the color right up to a fine line. Blending, I use it at an angle and make firm pressure strokes that come out painterly -- they look as if I applied oil paint with a flat brush and you can see the brush marks. Clay Shapers are extra firm Colour Shapers blending tools with dark gray tips. Royal Sovereign makes them in all the sizes and tip shapes. I purchased a set of all five shapes in Size 2 and they are even better for oil pastels than my Firm gray Colour Shaper. Clay Shapers are also available as Double Ended Clay Shapers with a metal ribboning tool the same shape as the tip, in Taper Point (cone shaped like a tortillon) and Flat Chisel. Clay Shaper sets are available at Blick in size 2 and size 6. I'll definitely pick up the large ones too sometime. Sizes on Colour Shapers are 0 (very small), 2 (about 1/4" wide), 6 (3/8" or so) and 10 at Blick Art Materials , though I haven't seen the largest ones in person. I have seen a size 16 one in a photo of her tools by a soft pastelist friend, and it's the size of a big wash brush for watercolor. I plan on getting a size 10 Firm Colour Shaper or size 10 Double End Clay Shaper for use with large paintings eventually. The taper point can be used to scrape out lines. The other shapes have different effects from blending to spreading and edging. One important use for any Colour Shaper, something you can do even with a Soft one, is to remove crumbs carefully or press them down into their proper color areas. I have de-crumbed more paintings with this tool, especially ACEOs. It became easier once I got the size 2 Firm Flat Chisel one because I was concerned about pressing too hard with the size 6 Soft one and damaging the point. Of all the shapes, I found the Flat Chisel Colour Shapers to be the most useful. If I want a small detail, I can pick up color with a corner of the end and place it with precision. I can push color up to the edges to get hard edges or pull it back and forth with painterly strokes to blend out a soft edge. If you try only one Colour Shaper, I would recommend getting a Firm Flat Chisel or a Double End Clay Shaper Flat Chisel. Either will give you a good idea of how these handle, what they're useful for and what effects you can get with them that are so much more precise than using fingers. All three hardnesses have the happy quality that they clean easily. I just rub off most of the accumulated color to clean them, using a soft rag. Occasionally after that there's a little stain so I'll rinse them in odorless turpenoid and it comes out fresh and new. When changing colors it's fantastic that the same blender can go from blue into orange without trailing any complementary pigment.